I went out on a crazy whim and decided to try and turn one of my hobbies into a business! I started Frequency LLC as an all-natural, essential oil, bath and body product business. It really began a few months ago when I was searching for a product, and found that it didn’t exist. So I made it myself and absolutely fell in love! Anyway, you are here for bullet journaling, not essential oils and crystals… But, if you’re interested here are links to my Instagram, Facebook, Etsy shop, Pinterest, and website. 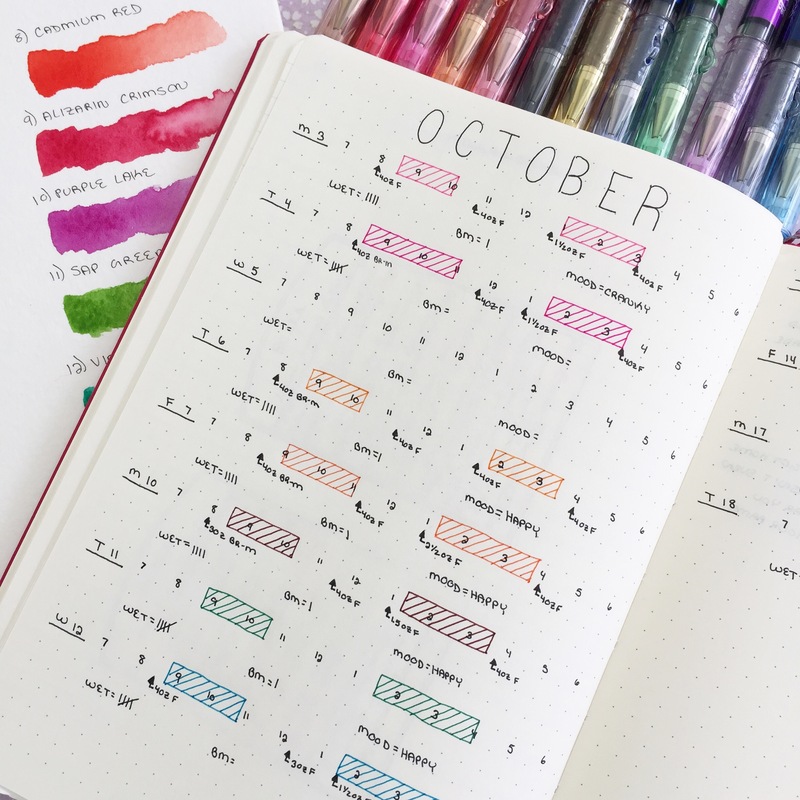 During the process of trying to stay organized and on top of things, I heavily relied on my bullet journal. I split my daily spread into 2 columns: one for home (the normal stuff I have always done in my BuJo) and one for work. I migrated tasks from each day to the next when they didn’t get accomplished, and just kept plugging away at them until they were done. And the list goes on and on for seemingly forever. There are a lot of little things to keep track of. And since I wanted to sell on my website and on Etsy, all of this information had to be entered twice. Then there’s the whole social media, advertising, etc portion… which I’ll save for another day, haha! Are you guys participating in InCoWriMo next month? The challenge is to write a snail mail letter a day for the entire month of February. I have decided to commit to the challenge! Yeah. I’m crazy. I know I don’t have the time to do the things I already want to do… then I go and commit to something like this, haha! Oh well, it makes me smile so I’m doing it! Everyone who sends me a letter will absolutely get a reply! It may not be the speediest reply, but it will definitely come! And of course, I had to put an InCoWriMo tracker in my Bullet Journal! The left page is a world map where I will put a dot in the location that I send a letter to. I’ll also write down the number that corresponds to the tracker on the right, so that I know who is where. I was also planning on filling in each country with color when I receive a letter from there. I’ve been wanting to snail mail and pen pal for a long time so I am really excited to get this started. Hopefully, this little map will get so full that I’ll have to transfer it to a larger one! Happy journaling! Happy Crafting! Happy letter writing! *These are affiliate links. If you purchase any of these items through the link, I will receive a small commission at no cost to you. I will only link to items that I have purchased, used, and would be willing to purchase again. Thank you for your support! Here is a short video just showing the basics of how I draw and fill in my new daily layouts. There isn’t any talking because I lost my voice, lol. It’s short and simple, but I hop you like it! The columns at the top are for my wellness tracking (happiness, calmness, fulfillment, physical health, and energy), steps for the day, water intake, sleep, and the last column I’ve been using for notes of the day. Sometimes the notes are gratitude entries, interesting events, but mostly they’re milestones that the baby has gone through or cool things she has done. What an amazing year 2016 has been! I hope your memories from the past 365 days are full of love and light! I’ve had ups and downs this year, but in the end the ups far outweigh the downs and for that I am thankful. For me, this year was full of change, growth, and life and I am so excited for all of the amazing adventures that 2017 will hold for our little family. By far, the biggest highlight of my year was Baby OhayoBento. She has spread so much joy in our world. I’ve never met anyone as genuinely happy as her and every day she inspires me to be more mindful in my actions and live each moment with light and wonder. My bullet journal has seen a lot of evolution over the past year. There was a lot of self-discovery in terms of what I needed in my planning and my style. One of the best things about bullet journaling, in my opinion, is the ability for constant change. If something isn’t working, change it! I started my BuJo with doodle and color heavy pages, taken directly from Boho Berry‘s style. Honestly, I think that emulating someone that inspires you is the best way to start. Then as your journal progresses, you start changing things little by little to suit your individual needs and style. I quickly found that it was just too much for me and that I naturally gravitate to a more minimal style. Simplification was my mantra this year. I needed to get my BuJo functional and not feel like work. It was just too much for me to try to maintain and all of the doodles felt too busy for me. I needed cleaner and simpler. Then I discovered the Zen Art Challenge and got hooked! I’ve loved doing Zen Tangles for years, and this challenge renewed my interest. I love having the prompts every day! My style was still pretty minimal, and I went through a short stint of trying weekly layouts, but my heart was still in doing daily spreads. And, finally at the end of this year I settled on a daily spread that is working really well for me… so far. 🙂 I know that it will change shortly, because it always does. And that’s OK. Actually, I prefer it. I’m looking forward to seeing what new types of spreads I’ll implement next year! Happy journaling. Happy crafting. And I’ll see you next time! My computer crashed!! I’ve never had a computer actually crash before, but the poor thing can’t even turn on. I apologize for the silence, and it’s been far too long so I’m going to try and blog from my phone. Wish me luck! I am so glad I started a baby BuJo when I was pregnant! It has been immensely useful in so many ways. My current favorite addition is the daycare records pages. I’m given a paper each day that shows when she slept, ate, mood, etc. I’ve found this to be incredibly useful for the weekends. We want to keep her on a consistent schedule as much as possible, so I am able to quickly glance at the page and try to mimic her eating and sleeping times. She still doesn’t like to take a nap at home, but it’s getting better every day! Watercolors: Winsor and Newton Travel Set LINK IS TO AMAZON, BUT GET IT AT A CRAFT STORE AND USE 40% OFF COUPON!!!! Mossery was super kind to send me one of their 2017 planners. I have to say, I’m impressed! For a pre-printed planner, this one seems to have everything I want and then some. Check out the video below for my unboxing and first impressions. Happy Journaling and Happy Planning! I love to journal. I have written about my day, feelings, and events pretty much consistently since I knew how to write. It has taken on different forms, been in different styles of notebook, sometimes it’s just writing and other times it included drawings, stickers, etc. One thing that has been constant is change. Lately, I have been really inspired to up my journaling game by @helencolebrook, @penpapersoul, @greenpaperleaf, @jobsjournal, and so many others. I think I’m going to start showing some ‘before the pen’ photos of how I’ve decorated the pages. But, until then, one morning I got a wild hair and decided to film the decoration process. I know this isn’t a bullet journal post, but these two communities of creative journaling and bullet journaling seem to go hand in hand. Enjoy!